Giants defensive coordinator Perry Fewell is not known as a blitzing coach. New York tends to utilize a four man pass rush but the Giant playbook does contain some nice blitzes. Here the Giants are in a 4-2-5 Nickel personnel group running a weak side overload blitz. The Seattle pass protection has 6 blockers for 6 pass rushers but the Giants still have a free rusher. How? The Giants attack the protection first using a deep safety in the pressure. The offense does not readily identify Safety Dion Grant as a blitz threat allowing the Giants to create a 4 on 3 pass rush to the right side. The Center becomes the most important player in the protection. If the Center helps to the defensive right the offense can pick up the pressure. 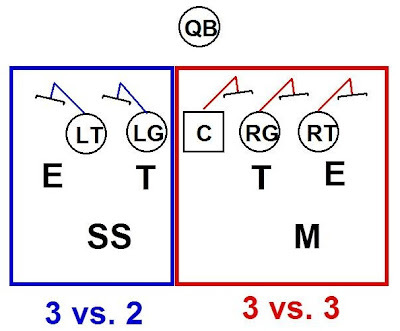 The Giants maintain their 4 vs. 3 advantage by manipulating the blocking of the Center. By walking the Mike up toward the A gap, New York presents an immediate gap threat to the Center. 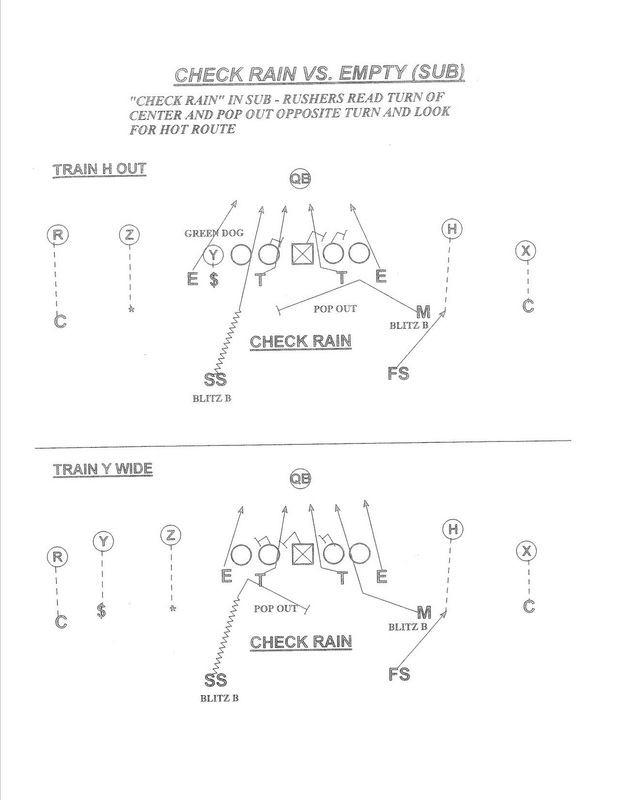 To prevent the Center from helping to the blitz side once the Mike drops out the left DT jabs to the A gap. Now the Center feels an A gap threat and looks to help the Guard with the Left DT. Once the DT feels the help from the Center, he works back to the B gap. Because the Center is occupied the looping DE is left unblocked. The pressure has added effectiveness because the blitzing Will linebacker engages with the right guard. The running back and guard end up blocking the Will leaving the Safety off the edge unblocked. Look for Perry Fewell to dial up a limited number of well designed and well executed blitzes vs. the Patriots in the Superbowl. Be sure to check out the Patriots Superbowl blitz preview here. 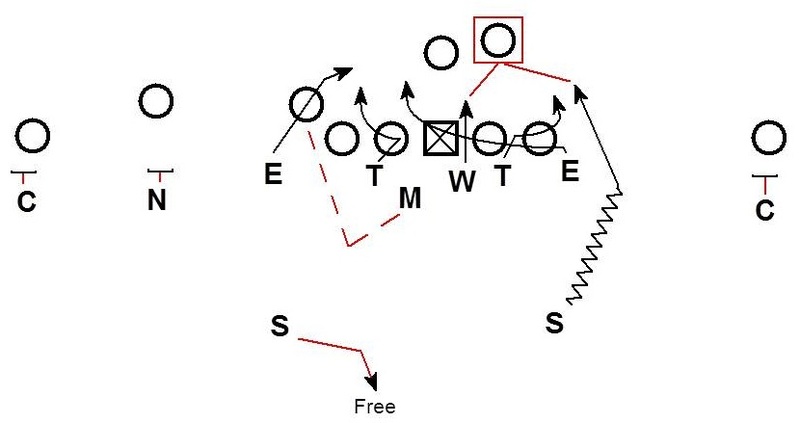 Here a simple and devastatingly effective blitz concept employed by the Patriots in the AFC Championship game against the Ravens. The Patriots align in a Dime personnel grouping with 6 defensive backs vs. the 5 wide receiver set by the Ravens. The Ravens have five potential pass blockers. It doesn't take great mathematical abilities to realize that if the defense brings 6 rushers there will be a defensive player unblocked. New England gets a free rusher while only rushing 5 by having the Mike and SS execute a read out blitz based on the slide of the protection. The SS is reading the block of the Left Guard. If the LG blocks the DT the SS blitzes and is unblocked. That is both what is diagrammed here and what happened in the video clip. The Mike is reading the guard to his side as well. If the guard is stepping toward him he will drop out, looking to cover the hot route from the opposite side. 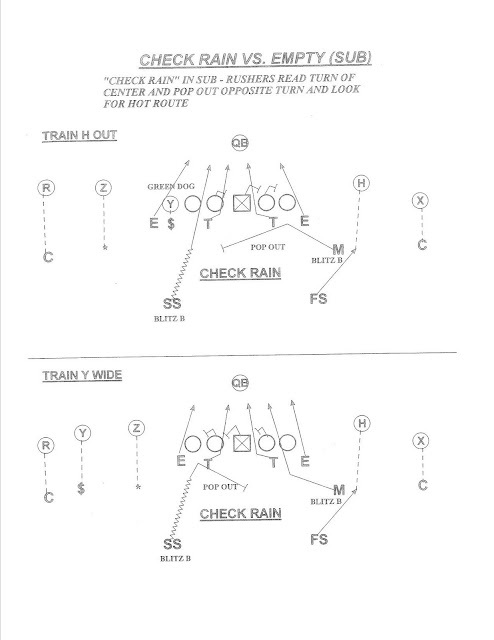 The Mike knows where the hot route is coming from because the protection and hot routes are linked. 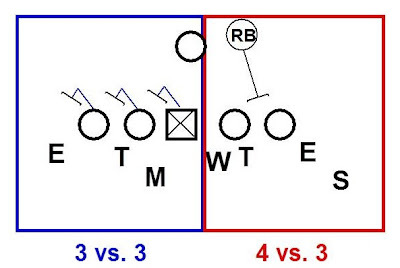 The offense can pick up 3 rushers to the defensive right of the center with 3 blockers. 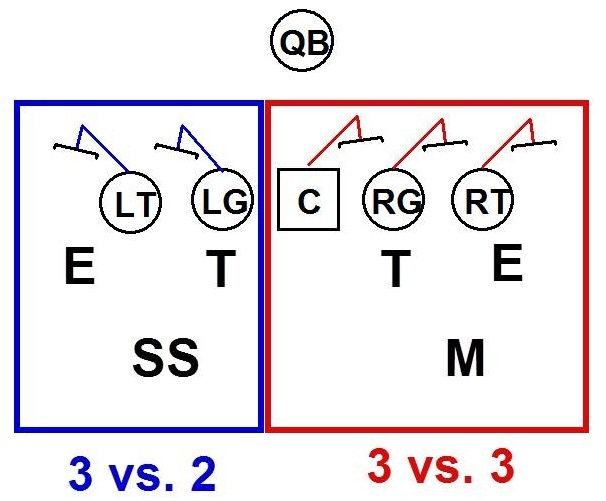 The Center can handle the A gap, the RG has any B gap rusher, and the RT can block an edge rusher. The offense knows it can block 3 rushers and therefore doesn't need to throw hot on the defensive right. On the defensive left however, the offense must throw hot because they can only block 2 rushers with the LG and LT. A third rusher to the defensive left cannot be accounted for by the protection. Therefore the Mike knows if the guard steps to his side the hot route is to the other side. What would have happened if the LG stepped to the SS instead? The SS would have dropped out and cut the crosser from the opposite side. The SS knows if the Guard is blocking toward him the hot route is coming from the other side of the formation. The Mike would then have the free rush in the B gap. Another factor in the success of this blitz is the Patriots utilization of a Dime package instead of a Nickel. The Patriots could have easily used an ILB in place of the SS and played a 4-2-5 personnel instead of a 4-1-6. The job of the SS position on the call is to blitz or cover a hot route both tasks a linebacker is capable of executing. The beauty of using a Dime package is there is only one linebacker (Mike). The offense is more likely to slide to the Mike linebacker than toward a SS. Bill Belichick is manipulating the pass protection by exploiting the offense's expectation of the SS's role on defense. A SS should be covering a receiver or a zone not walked up into the B gap to blitz. Where else can you find this pressure concept? 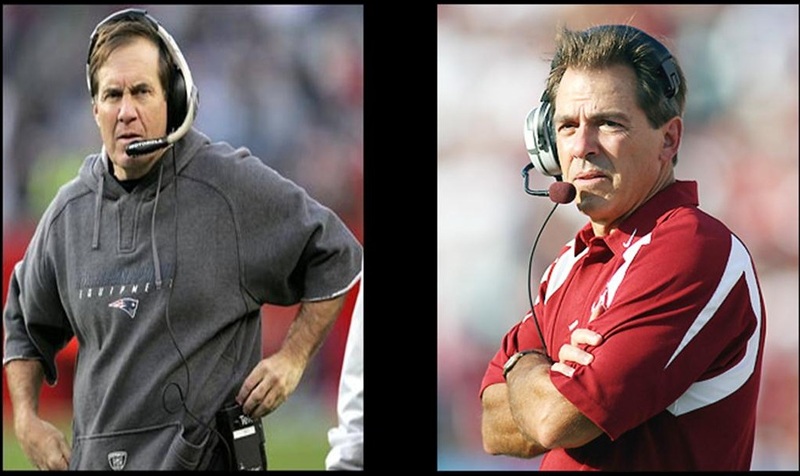 In the Alabama playbook of former Bill Belichick assistant Nick Saban. 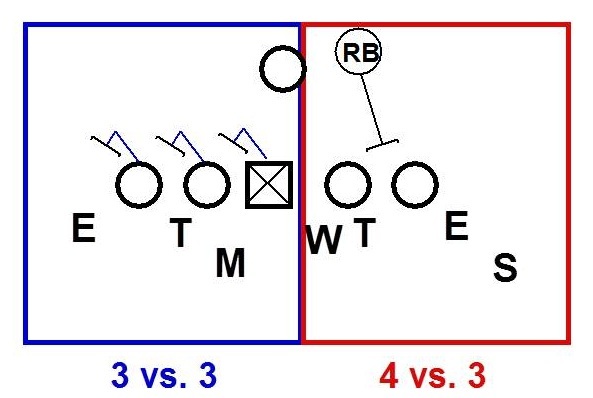 Simple effective blitz schemes like this are just one of the reasons Bill Belichick and Nick Saban have their teams in the championship hunt every year. Be sure to check out a preview of the Giants Superbowl blitz package here. 2012 was another great year at the convention. 10,000 football coaches hit the Riverwalk in San Antonio. One of the speakers was legendary Florida State DC Mickey Andrews. The defensive back coaches were excellent (Chris Ash-Wisconsin, Maurice Linguist-James Madison, and Wesley McGriff-Vandy). Also head coaches Mike London and Paul Winters were very interesting. I encourage any coach who is not a member of the AFCA to join. The convention is a great chance to meet other coaches, talk football, see the latest football products & equipment, and continue to develop in the coaching profession. Next year the convention is in Nashville.